GREEN BAY, Wis. (CNS) — The only facility still performing abortions in the northeast Wisconsin has suspended abortions for the next six months. Planned Parenthood in Grand Chute suspended abortions in mid-October, citing a lack of medical staff. The building, and Planned Parenthood’s office in Appleton, remains open. While Planned Parenthood did not respond to The Compass, Green Bay’s diocesan newspaper, various news reports and sources say that the suspension is because officials there lack an abortion doctor for the site. Bishop Ricken also offered prayers for others connected with the Grand Chute facility. In Washington and in several states, calls for defunding Planned Parenthood and investigating the organization have followed the release of several videos, taped undercover, that show physicians and others associated with Planned Parenthood describing the harvesting of fetal tissue and body parts during abortions at their clinics. Also discussed in the videos are what researchers are charged for the tissue and parts. The House voted Oct. 23 to suspend federal funding of Planned Parenthood for a year, but the Senate still needs to take up the bill. The House also appointed a new panel to investigate Planned Parenthood. Gail Hjortness heads the 40 Days for Life in Appleton campaign, which was concluding Nov. 1. “It’s been pretty exciting that they aren’t doing abortions there,” she said about the Grand Chute facility, adding that the last abortions were performed there Sept. 28 and 29. Hjortness said that some of the people who have been praying at the Grand Chute site at first wondered if they still needed to go out there. Hjortness assured them they should, explaining that clinic personnel are still offering abortion consultation for women and use Skype to arrange referrals to the Planned Parenthood clinic in Milwaukee. With that in mind, Hjortness said that local churches involved in the 40 Days campaign “all agreed to send people out there on a regular basis,” with each church signing up for prayer on specific days of the month. Some of those who pray regularly at the clinic belong to St. Pius X Parish in Appleton. Father Tom Farrell, pastor, has led a eucharistic procession from St. Pius to the clinic each year for the past nine years. 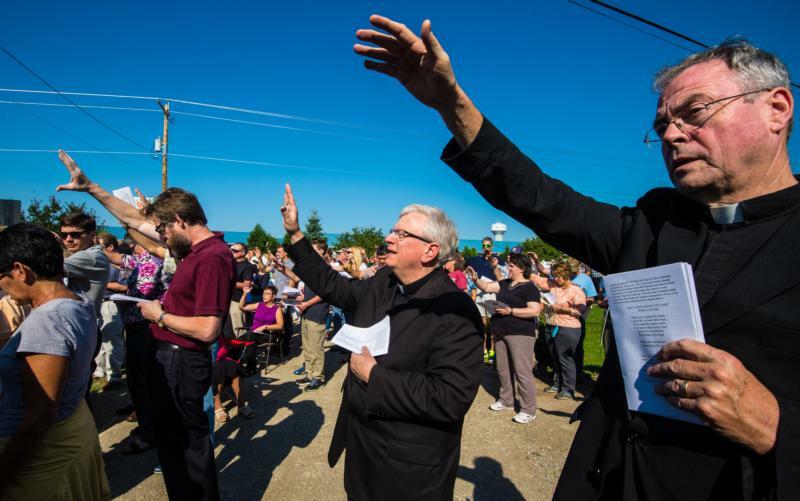 He called the news of the suspension of abortions in Grand Chute “a beautiful thing” and added his gratitude to everyone who has prayed outside the clinic. Earlier this year, Wisconsin’s Department of Health Services reported that abortions around the state decreased in 2014 by 10 percent, the sixth straight year of abortion declines in the state. There were 5,640 induced abortions reported last year. That number does not include chemical abortions. “Faithful pro-lifers’ prayers have been answered after 43 years in the desert,” Miller added, referring to the 1972 Supreme Court companion decisions — Roe v. Wade and Doe v. Bolton — that legalized abortion virtually on demand in the United States. Elsewhere in the Midwest, pro-life leaders announced the permanent closure of a Chicago abortion clinic that had been the focus of 27 years of community objection, led by the Pro-Life Action League. The clinic also had been sued over the years by family members of women who died while getting an abortion there. One was a 13-year-old girl, Deanna Bell, who died during an abortion in September 1992. From the time that the clinic opened in 1988, the Pro-Life Action League has organized sidewalk counseling, conducted protests and coordinated prayer vigils outside of the facility. Back in Appleton, Hjortness and others are already planning to be back at the Grand Chute clinic April 1, when the six-month suspension is set to end. Kasten is the associate editor of The Compass, newspaper of the Diocese of Green Bay.